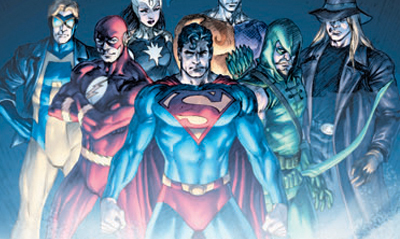 It's A Dan's World: JOHNS AND TOMASI TO RESURRECT THE RESURRECTION MAN? JOHNS AND TOMASI TO RESURRECT THE RESURRECTION MAN? DC's Source blog has a pretty swell selection of variant covers on show, teasing their upcoming releases. 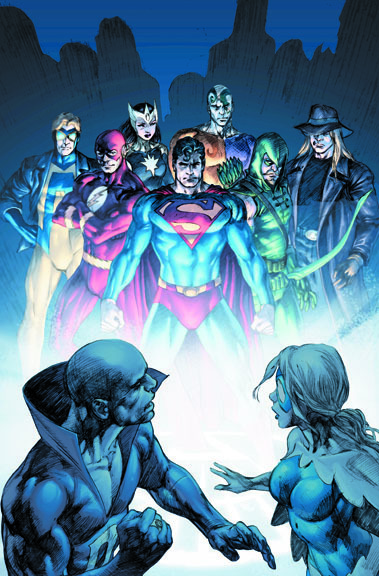 But did you catch who was standing with presumably the Justice League, on the right of Ivan Reis' cover for Brightest Day #13? Mitchell Shelley - Resurrection Man! For the un-initiated Resurrection Man was more than just a modern Highlander, Mitch literally died to save you - repeatedly. Whenever he popped a cork, nanotechnology in his body would resurrect him shortly after, with a different power to the one he perished with. Sometimes the power was on par with the likes of the Hulk, other times it was, well, not - and he'd have to be a hero with that ability until he died and returned again. Think Dial 'H' for Hero - with memory issues and a price on his head. Written by one of the true sources of comic goodness, writers Dan Abnett and Andy Lanning, it was an awesome series that sadly never got to go the distance. 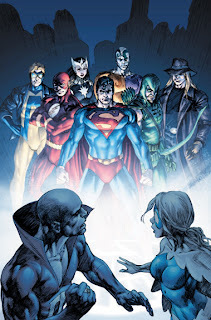 While this League is no doubt from the future or another reality, having Mitch on the team that faces the biggest odds in the business, is almost as cool as the thought Shelley could also be riding the Brightest Day train out of comic-book oblivion soon.